There’s a funny story about how you can eat French baked custard in Southern America. When I came to Starkville, it was my big surprise in the eating custom here. No baked custard you can find in any restaurants, even one of my American friends told me that’s his first time try this airy cake. 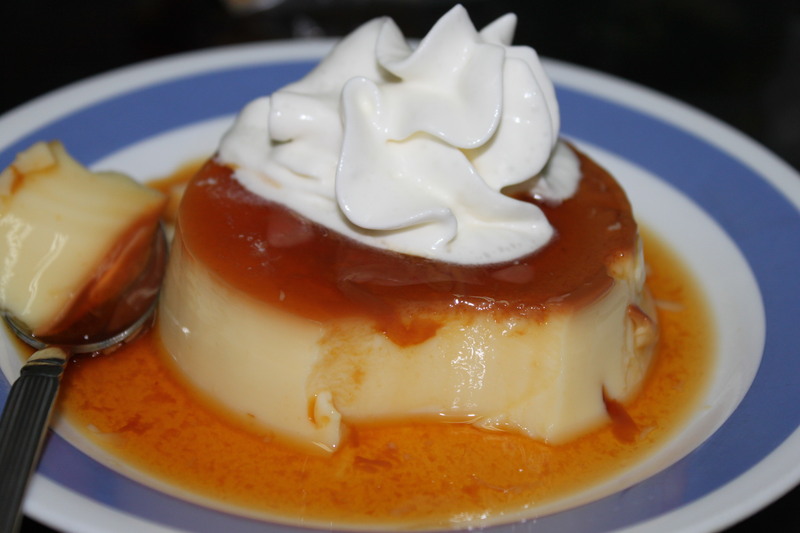 No reason why Vietnamese call this custard “Caramel”. Maybe it’s due to the thin layer of bitter caramel on top of the custard. My recipe use regular milk as the original style of this cake. You can use heavy cream and milk medley to increase the fatty taste for your custard, however. My American friend was served both 2 types of baked custard and she prefers the fatter one. – Pour the caramel into 6 ramekins. It’s unnecessary to cover all the bottom of ramekins. Don’t worry, the caramel will be melt evenly as it bakes in the oven. – In another clean sauce pan, heat the milk until it’s hot but not boiled. Beat the eggs with a medium whisk to mix all the whites and the yolks together. Here is the experience in making a smooth surfaced custard. You should avoid beating eggs with stand mixer or hand mixer. This wrong action will bring foam to the eggs, thus your custard will have bubbles on top. – Pour the half of the hot milk into the beaten eggs, then pour the egg mixture back into the sauce pan . – Use a mesh strainer, pour the custard liquid into ramekins. Set the oven at 320 F. Bake the custard for 30-40 minutes until the custard is set thoroughly but be careful, don’t over bake it if you try to be lazy. Your overbaked custard should have a taste of baby food. Don’t you like it, do you? – Keep the custard totally cool down in the refrigerator. To serve, unmold the custard by using a knife and invert it onto a plate. The caramel sauce with the bitter taste combines with the sweet and tangy custard bring you the most perfect flavor you’ve ever had of a dessert. This entry was posted in dessert, French and tagged dessert, french. Bookmark the permalink.